CarGurus has 631 nationwide Forte Koup listings starting at $3,395. The 2012 Kia Forte Koup 2-door compact car displays a sportier appearance than its Forte sedan and hatchback stablemates, thanks in part to a number of performance-oriented exterior upgrades, and sits on a sport-tuned suspension with a lowered ride height for a more spirited driving experience. The 2012 Forte Koup's tight suspension can sometimes result in a harsh ride over rough road surfaces, and the rear seat remains a tight fit for 3 taller adults. 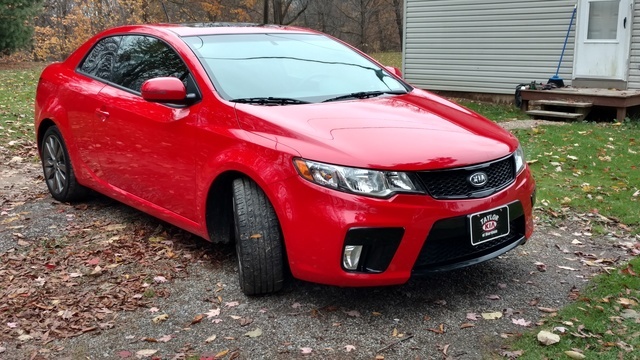 Although it doesn't quite compete with the best in the class, the Kia Forte Koup offers a good overall balance of sport-oriented performance and affordability. Prospective buyers can probably find a competing vehicle that outclasses the Forte Koup in performance and handling, but mix in a stylish exterior design, a strong list of standard features and a comfortable, well-appointed cabin with standard sport seats, and the Forte Koup becomes very appealing to buyers on a budget who still seek a sporty, above-average ride. Reviewers say the sport-tuned suspension can feel harsh over rough roads, so prospective buyers will want to put the Koup through its paces during test drives, but current owners seem to like the vehicle's performance, ride and handling, as well as its reasonable price tag. 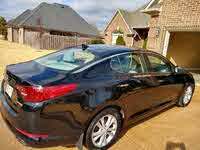 When it debuted in 2010, the Kia Forte Koup broke new ground as the automaker's first 2-door sports coupe. Designed to compete against such sedan-based vehicles as the Honda Civic Coupe and Scion tC coupe, as well as Hyundai's Veloster, which debuted a year later, the front-wheel-drive Forte Koup came well-equipped with such standard features as Bluetooth and SiriusXM satellite radio, giving it a leg up on the competition. But for 2012 the Koup treads water, allowing its competitors to match and even exceed it as times. The Veloster, for instance, also includes Bluetooth and satellite radio, as well as a navigation aid not found in the Koup. In addition, the Veloster and Scion tC both include a tilt/telescopic steering wheel, which now comes as standard equipment on both Koup trims. Kia again offers the Forte Koup in entry-level EX and sport-oriented SE trims, each with a different engine. In addition, owners can opt for either a 6-speed manual transmission or a 6-speed automatic in both trims. Although it's based on the Forte sedan and rides on the same 104.3-inch wheelbase, the Koup overall measures almost 2 inches shorter (176.4 vs. 178.3 inches) and sits 2.4 inches lower (55.1 vs. 57.5 inches) than the sedan. It's also 0.4 inches narrower than the sedan, and has a ground clearance of 5.5 inches, compared to the sedan's 5.9 inches. Outside, the Forte Koup displays a number of sport-oriented components not found on the Forte sedan and hatchback, including a front lip spoiler and airflow deflectors underneath the vehicle, which help to reduce drag. Up front, a black mesh grille, swept-back auto on/off headlights and a large lower front air intake give the Koup a sporty look. Other standard exterior features include dual chrome exhaust pipes and power side mirrors with integrated turn signals. 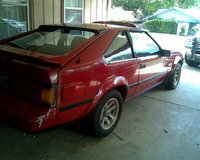 The SX also receives front foglights, gloss-black front accents and wraparound LED taillights. Exterior colors for 2012 include Corsa Blue and Racing Red. Kia offers the Forte Koup trims with 2 different engines. A base 2.0-liter 4-cylinder engine continues to power the entry-level Koup EX. It generates 156 hp and 144 lb-ft of torque, and features Dual Continuously Variable Valve Timing (CVVT) and multi-port electronic fuel injection, which help ensure good performance and fuel efficiency. The engine connects to a 6-speed manual transmission, which comes standard, or an optional 6-speed automatic with a Sportmatic manual-shift feature. Fuel economy numbers check in at 24 mpg city/33 highway with the manual transmission and 25/34 with the automatic. The sport-oriented SX receives a more powerful 2.4-liter 4-cylinder engine, also equipped with Dual CVVT and fuel injection. It delivers 173 hp and 168 lb-ft of torque, resulting in a more aggressive ride. The larger engine also links to either the 6-speed manual transmission or the 6-speed automatic. When equipped with the automatic transmission, the SX gets steering-wheel-mounted paddle shifters as a standard feature. Fuel economy numbers drop slightly, to 22/32 with the manual shifter and 23/31 with the automatic. While both engines provide a good balance of performance and fuel economy, and do an adequate job of powering the Forte Koup, some reviewers would like to see more horsepower from both engines. 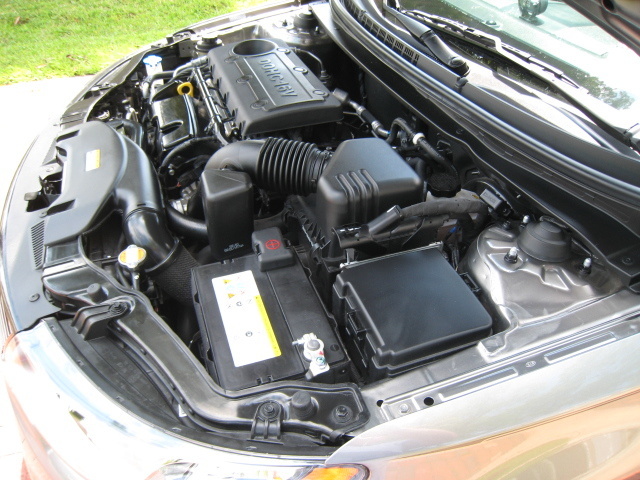 Naturally, if given a choice, reviewers prefer the Forte's larger 2.4-liter engine. At the same time, the Koup's fuel economy numbers don't quite match those of the best in the class. The Honda Civic Coupe, for instance, manages fuel economy numbers of 28/36 from its 1.8-liter engine, although the sportier Civic Si Coupe gets only 22/31 from its upgraded 2.4-liter engine. The Hyundai Veloster, meanwhile, gets up to 40 mpg from its 1.6-liter engine. Reviewers say the Kia Forte Koup doesn't provide the optimal ride and performance expected from a sport-oriented coupe. Kia stiffened the Koup's body and tweaked its suspension for a sportier driving experience, and the vehicle behaves relatively well in tight corners, with minimal body lean and good overall responsiveness. However, some testers say the tightened suspension results in an overly harsh ride, especially over rough road surfaces, which some owners might not find comfortable enough for daily commutes. Buyers who prefer a more compliant ride might want to opt for the EX rather than the SX, with its sport-tuned suspension, or even the Forte sedan or hatchback, which ride on more traditional suspensions. The Forte Koup comes equipped with an independent front suspension featuring MacPherson struts and a stabilizer bar, and a torsion beam configuration in the rear, with monotube shock absorbers and coil springs in both the front and the rear. The SX gets an upgraded sport-tuned suspension, which doesn't match the systems in some competitive vehicles, according to reviewers. The SX also receives larger 11.8-inch vented disc brakes in the front, compared to 11-inch brakes in the EX. Both trims feature 10.3-inch solid disc brakes in the rear. Power-assisted hydraulic rack-and-pinion steering comes standard on both trims. Kia tunes the Koup's steering a little tighter than the Forte sedan's and hatchback's for improved agility. The EX rides on 16-inch alloy wheels, while the SX gets 17-inch alloy wheels. New noise-inhibiting materials in the engine bay, as well as improved door and window seals and sound-dampening foam in the body, help ensure a quiet cabin. For 2012, Kia adds a tilt/telescopic steering wheel as a new feature for the Forte EX, making it standard across the line. Both trims also come equipped with unique front sport seats, which feature large bolsters on the cushion and seatback to support the driver and front passenger during aggressive driving maneuvers. Reviewers say the seats provide good overall support and are comfortable enough for longer trips. However, reviewers also say the rear seats aren't as comfortable as the front. The Koup seats 5, although 3 tall adults might find the second-row seat a tight fit. Generally the cabin provides good legroom and headroom in both the front and rear. Cargo space in the trunk measures 12.6 cubic feet, which expands to 53.4 cubic feet with the 60/40-split rear seats folded down. The Koup's comfortable cabin, borrowed from the sedan, matches up well against the cabins of competitive vehicles. Owners and reviewers generally like interior build quality, well-made materials and overall fit and finish, though some testers point out a few hard surfaces and inferior materials. An attractive center stack places controls and knobs within easy reach of the driver, and gauges are well-located and simple to read. One of the Forte's strongest calling cards remains its long list of standard features. In addition to the tilt/telescopic steering wheel and sport seats, such features as remote keyless entry, steering-wheel-mounted audio and cruise controls, an outside temperature display, dual map lights and air conditioning come standard on the Koup. In addition, a 6-speaker AM/FM audio system includes Bluetooth and SiriusXM satellite radio, as well as a CD/MP3 player, a USB port, an auxiliary input jack and 2 tweeter speakers. Other standard features on both trims include a 6-way manually adjustable driver's seat with height adjustment and power windows and door locks. The EX gets cloth upholstery, while the SX upgrades to sport cloth seat trim with red stitching. The SX also adds a leather-wrapped steering wheel, a Supervision instrument cluster with red gauges, and metal-finish interior accents and pedals. A Leather Package for the SX adds leather upholstery, heated front seats and an auto-dimming rear-view mirror, while Technology Packages for both trims add a navigation system, a rear-view camera and push-button start, among other features. For 2012, the EX's Technology Package also includes the Supervision instrument cluster. The IIHS named the Kia Forte Koup a 2012 Top Safety Pick, due to its top rating of Good for protecting passengers in all types of crashes. The NHTSA awarded the Koup an overall safety rating of 4 out of 5 stars, since it received 4 stars for protecting passengers in frontal, side, rear and rollover crashes. Kia equips the Forte Koup with 6 standard airbags, including front, front seat-mounted side and full-length side-curtain airbags. Other standard safety features for the Koup include electronic stability control, traction control and 4-wheel antilock brakes with electronic brakeforce distribution and brake assist. The Kia Forte Koup gets good marks from owners, who like its exterior styling, handling, acceleration, interior and overall affordability. Owners also like the Koup's performance, although they say the engines can become noisy when pushed. A number of owners say they shopped around quite a bit before they settled on the Koup, in part because it offers a lot of car for the money. The Koup offers a smooth, comfortable ride, owners say, and a number them agree that it's a fun car to drive. The Koup delivers relatively decent fuel economy numbers, owners report, and most don't have a problem with the sport-tuned suspension. A number of owners have found minor problems with the car, including the manual transmission, which some owners call clunky, and some owners have difficulty with the positioning of the driver's seat. But overall owners say the Koup represents a lot of car for the money. What's your take on the 2012 Kia Forte Koup? Have you driven a 2012 Kia Forte Koup? My new and old oil control valve will not go back in. How can I fix it.